Among venerable UK rock institutions, with Black Sabbath and Jethro Tull dispersing, we are, perhaps, really, down to just Deep Purple, Yes and Uriah Heep left to uphold the tradition of quality original progressive hard rock forged at the very beginning of a golden era for this music, late ‘60’s into the nexus year that was 1970. At that crossroads, along with Led Zeppelin, Black Sabbath and Deep Purple, Uriah Heep helped invent a decorative and uniquely British form of heavy metal with their debut album, Very ‘Eavy, Very ‘Umble, offered as a self-titled on American shores, but whatever the titling, historically massive in the invention of a music format that would rule the ‘70’s and only intensify in the ‘80’s. Uriah Heep have been responsible for the most elevated and intelligent use of vocals in a heavy metal context amongst the major bands inventing the genre in the 1970’s. It is for this reason Heep were coined the Beach Boys of Heavy Metal, and their influence is there for all to see in other bands including ‘Queen.’ They were also one of the forerunners of using the Hammond organ along with Micks signature wah wah guitar and this became the template for their sound. Indeed, some of these personnel shuffles might have been responsible for a fallow period in the late ‘70’s, the accepted nadir in the narrative being 1980’s Conquest record. But in 1982, the band stormed back (as they would again in 1995) with a classic of British heavy metal called Abominog, which entered the top-40 in the US. This album featured Peter Goalby on vocals. and in the annals of Uriah Heep history, this record, a conquering document released smack in the thick of the New Wave of British Heavy Metal, is revered by Heep fans on par with such classics as 1971’s Look at Yourself and 1972’s Demons and Wizards, even if the band’s music had been overhauled and supercharged for a new decade. Similarly stadium-rocking records Head First, issued in 1983, and Equator, issued two years later, capped off this exciting era for the band. As a way of contextualizing the band’s extensive history, the well regarded FM-friendly Peter Goalby years might be considered the third era of Heep’s extensive and productive history. As recap, one might frame the first era of the band as encompassing the classic David Byron years along with the productive co writing stewardship of Ken Hensley, culminating in 1973’s double Live album, sent to #37 on the US charts with the help of timeless Heep classics like “Sunrise,” “Sweet Lorraine,” “Circle of Hands,” epic masterwerk – “July Morning” and smash hits – “Easy Livin’” and “Love Machine,” both examples of the band’s mastery of the heavy metal shuffle. Indeed, given the massive commercial status of Uriah Heep in the ‘70’s, along with considerable attention afforded the guys in the early ‘80’s, it’s become a bit of an urban myth that this is a band plagued by lineup changes. 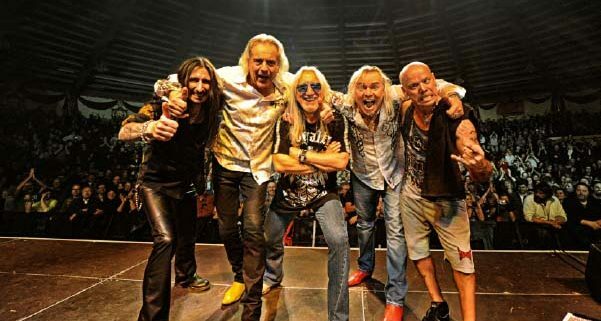 The fact of the matter is, for over 30 years, from 1986 to 2007, Uriah Heep had consisted of patriarch Mick Box on lead guitars, Bernie Shaw on vocals, long-time member Lee Kerslake on drums, Trevor Bolder on bass and Phil Lanzon keyboards. Indeed, if through the 1990’s, Uriah Heep had worked at a relaxed pace they’ve issued three albums of completely new music—Wake the Sleeper, Into the Wild and Outsider—with a fourth scheduled to be recorded in October of 2017. The run, however, really begins with the highly regarded Sea of Light from 1995, a fan favorite that finds the songwriting team of Box and Lanzon yielding huge creative returns. Up into 2014’s Outsider, on which the two co-write every song, the band were rewarded with a late-period hit in “One Minute,” a huge crowd-pleaser at all live shows across the globe.